The next issue of Bridge Magazine features articles and analysis of Lynch's films. The articles are by Toby Keeler, Barry Gifford, Mario Falsetto, Adam Jones and Rikki Ducornet. You can purchase a copy of the magazine online when it becomes available here (I believe Bridge 6 will be the one with the Lynch stuff, but double check the content listings before ordering to be sure). Thanks to Marie Walz for the info. 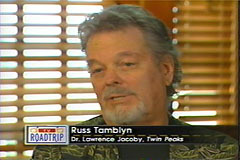 The Travel Channel has been kind enough to provide us with an advance copy of the TV Road Trip series episode featuring locations from Twin Peaks. The show, hosted by Christopher Knight (Peter from The Brady Bunch) will air Sunday, March 30 at 10 p.m. (ET/PT) on the Travel Channel. The Twin Peaks section is at the end of the episode (which also includes locations from the Sopranos, Saturday Night Live, Homicide and Crime Story). 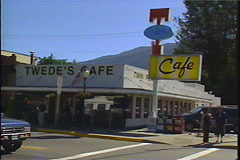 The show features interviews with Catherine Coulson, Russ Tamblyn and Kimmy Robertson, the latter of whom drops by Twede's Cafe (aka The RR Diner) for a slice of cherry pie. Tamblyn recounts how the colored glasses came about, and Coulson discusses the meaning of the log. 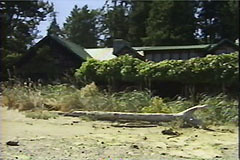 Twin Peaks Pilot production manager Eugene Mazolla takes the viewer around some of the various shooting locations that doubled for Twin Peaks. Sites include Mt. 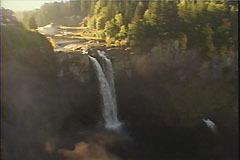 Si, made famous by the shot with the Twin Peaks sign, Snoqualmie Falls, Mount Si High School, which doubled for Twin Peaks High School, the Double R Diner and the beach where Laura Palmer's body was found in the series. Mazolla recounts how Sheryl Lee got so cold while filming the scene that she literally turned blue, and the producers hardly needed to touch her up with make-up because she really looked like a corpse. Most of the information in the show will be old news to long time Twin Peaks fans, but it's nice to see how the locations are fairing today, especially for those who don't make it to the yearly Peaks Fest. Unfortunately, the segments for each TV series are really short, so you don't get much more than a brief image or two of each location covered. Instead of doing five series in one show, they really should have done just two and given more time to them. It's kind of sad that a cab from Taxi gets a longer shot than Snoqualmie Falls. But maybe if the series gains popularity they'll expand it and take a bit more time with the shows they feature. It's still a good starting place for those unfamilar with the real locations used in Twin Peaks. 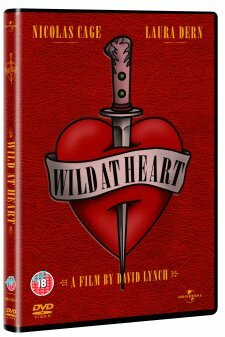 Wild At Heart will be released on DVD in the UK on May 12. The disc features English, German and French soundtracks, all 5.1, and an anamorphic widescreen transfer in the films original 2.35:1 aspect ratio. It doesn't look like the DVD will have any extras at all, but you never know for sure until the disc actually comes out. So far no one I've asked to write a review of the Blue Bob concert has come though, but there's a review online from a french photographer at another website you can take a look at. You can read the review here. Thanks to Faxo for the link. Have you ever wished you could follow (carefully!) in the footsteps of those wiseguys in The Sopranos?...run through the glorious hills that captivated audiences in The Sound of Music?... touch one of Babe Ruth's famed "home run" baseball bats?... or discover the secret of how Harry Houdini escaped his straightjackets? On the heels of last year's highly successful TV Road Trip special, Travel Channel broadens the genre with a new series ROAD TRIP that maps out an entire season of memorable, globe-hopping, nostalgic tours tailored especially for TV fans, movie buffs, sports enthusiasts, magic mavens, ghost busters and much more. On Travel Channel's Opening Night, Sunday, March 30, viewers will get a sneak peek at the ROAD TRIP series with an all-new episode of TV Road Trip airing from 10- 11 PM (ET/PT). The ROAD TRIP series officially begins on Thursday, April 3, with a special two-hour premiere of Movie Lover's Road Trip from 9-11 PM (ET/PT). The one-hour series will air regularly on Thursdays from 10 -11 PM (ET/PT). 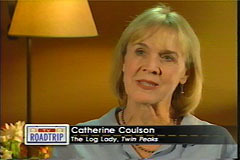 "When TV Road Trip premiered in April 2002, it received an enormous response from our viewers," says Steve Cheskin, president of Travel Channel. "In fact, it was the highest rated program among our target audience -- ever. With this in mind, we are delighted to introduce an expanded version that taps into our audience's many different interests and travel wish-lists." No ordinary by-the-book tours, these genre-specific journeys are populated by a mix of unforgettable personalities who breathe life into each destination. For example, viewers will find themselves drag racing down "Paradise Road" with Candy Clark "Debbie" from American Graffiti...following the Yellow Brick Road to the annual Wizard of Oz festival with some of the original munchkins from the movie... roaming through Camden Yards with Cal Ripken and Texas Stadium with Tony Dorsett...setting sail on the real Love Boat with Gavin MacLeod, the fastidious "Captain Stubing"... or visiting Homicide's gritty Baltimore precinct with actor Peter Gerety who played "Detective Stu Gharty" on the series. Grab your remote control and join host Christopher Knight ("Peter" from The Brady Bunch) as he travels from the past to the present for a look at classic TV settings with some of the cast members who brought them to life. Viewers can check out who really sleeps with the fishes with a tour of Sopranos mob hangouts in Northern, New Jersey and in Little Italy in NYC, get bowled over in the real "Stuckeyville" (Northvale, New Jersey) with Ed cast members Tom Cavanaugh and Michael Ian Black, and step back in time to Plum Creek, Minnesota and Simi Valley, California with Little House on the Prairie's Alison Arngrim "Nellie Oleson" and Dean Butler "Almanzo Wilder." Matt Harris is Producer. Debra Weeks is co-executive producer on the TV Road Trip, Movie Road Trip, Fireworks Road Trip and Haunted Road Trip episodes. Kathleen Cromley is Executive Producer for the Travel Channel. Steve Cheskin is the executive in charge of production. Travel Channel is the only television network devoted exclusively to travel entertainment. Capturing the fascination, freedom and fun of travel, Travel Channel delivers insightful stories from the world's most popular destinations and inspiring diversions. It is available in more than 70 million homes and is a service of Discovery Networks, U.S., a unit of Discovery Communications, Inc., owns and operates the Discovery Channel, TLC, Animal Planet, the Travel Channel, Discovery Health Channel, Discovery Kids Channel, The Science Channel, Discovery Home & Leisure Channel, Discovery Civilization Channel, Discovery Wings Channel, and Discovery en Español. The unit also distributes BBC America. Visit Travel Channel on the Web at www.Discovery.com. AUSTIN, Texas (AP) - Midnight screenings of two tiny horror flicks drew some of the biggest buzz at an otherwise low-key South by Southwest film festival. One was ``Cabin Fever,'' the subject of a bidding war at last year's Toronto International Film Festival that eventually went to Lions Gate Films for $3.5 million. The other was ``The Eye,'' a Hong Kong film that Tom Cruise's production company already plans to remake. Both have relatively unknown actors and small budgets, but they represent a return to old-school gore and suspense that the festival's audiences found irresistible. About 100 people were turned away from a midnight showing this week at the Alamo Draft House, a theater-restaurant where you can enjoy burgers and beer with your on-screen blood bath. Those who managed to get a seat screamed, laughed and hollered at all the right places - and afterward, when Roth addressed the crowd, he received a deafening ovation. Tom Ortenberg, president of Lions Gate Films, picked up the film immediately after he saw it in Toronto in September. ``It seemed clear from early on in the film as we were watching it that 'Cabin Fever' works on several levels,'' said Ortenberg, who plans to release the film in late summer. Some people have emailed thinking that our Eraserhead review is a negative one. It's not really. It's still a great looking transfer with good sound and one hell of an outstanding bonus feature. Really, the only drawback it has is that if it'd been on two discs the bitrate could have been slightly higher, allowing for less artifacting. That's really just nitpicking though, most people probably won't even notice. Make no mistake about it, this is the best Eraserhead has ever looked on video and probably the best it ever will until some form of HD format takes off. Anyone who's a fan of the film will enjoy this DVD. DVDfile.com has a review up of the new Eraserhead DVD. You can read it here. Eraserhead is now available on DVD from Korea. It's pretty much the same as the UK version (full frame, poor contrast), so there's really no reason to bother with it unless you want it for collector's sake. You can order it from Scarecrow Video. Remember, despite what it says on their page about being remastered, this is not the new restored version Lynch just released. That version is only available via the store at davidlynch.com. Thanks for jahaase for the Korean DVD info. LynchNet would like to wish John Neff a happy birthday today! You can read our review of the new Eraserhead DVD here. We'll have reviews of the "I Don't Know Jack" DVD and new Eraserhead Sountrack Plus CD up soon as well.